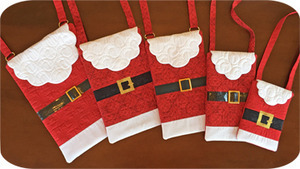 Santa is coming to town in the form of this stylish holiday bag. These open top bags secure with a cute quilted beard flap and snap. The quilted beard flap is stitched in your hoop before starting the bag. Santa's suit features snowflake quilting.